Lore | Beer Apprentice - Craft Beer News, Reviews, Interviews and Info. Hello guys. 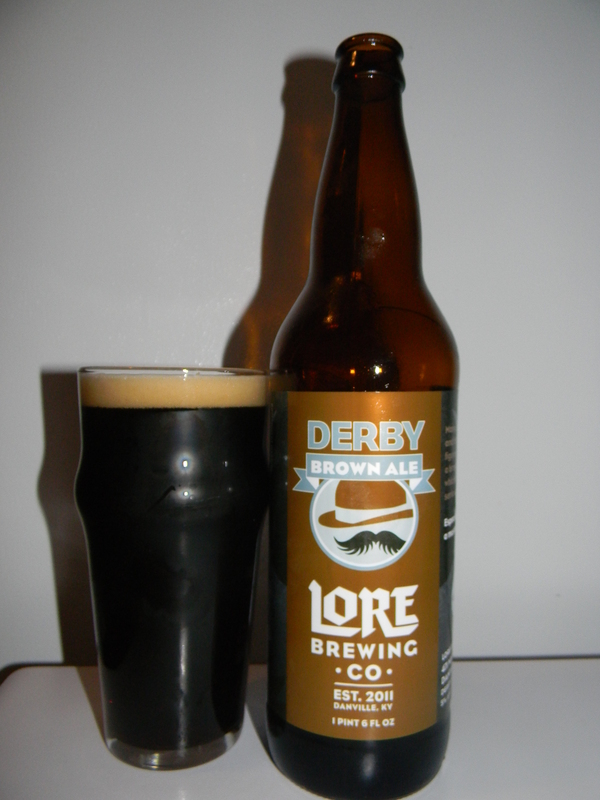 It’s time for another craft beer review and today I’m going to be trying the Derby Brown Ale produced by the Lore Brewing Company located in Danville, Kentucky. I’m always excited about tasting a beer from my home state and this will be my first time trying anything from Lore. From the website, lorebrew.com, we find this bit of knowledge about the Derby Brown Ale. The best way to describe Derby Brown Ale? An adorable, cuddly monster. This beer uses a large amount of hops and roasted malts while still remaining refreshingly mild and drinkable. We use a large percentage of Chocolate Malt mixed with lighter Caramel malts to add complexity of flavor and a satisfying mouthfeel. This is a great “sit down and relax” type of beer that you’ll enjoy for all occasions. Alrighty. Let’s give it a try. This beverage came in a 22 oz. bottle and it had an ABV of 5.0%. It poured a deep brown color with some ruby outlines shown around the curves of the nonic glass. A small tan crown was formed from a semi-aggressive discharge. The texture was smooth and soft, however the retention time was meek and the lacing was only average. The nose was very dainty and delicate. Some tones of toasted and roasted grain along with some toasted bread crusts. A light nuttiness of almond and hickory nut fused with some earth tones created a very “round” and well balanced profile. It was just very subdued and feeble. The flavor brought out some more of those toasted breads and grains. The almond and hickory nut were accounted for again as well. One thing that was troubling was that it had some sort of overly carbonated taste without being overly carbonated. If that even makes sense. That became a bit distracting as I went along. So much so that I really couldn’t discern any of the other attributes. The mouthfeel was medium to light bodied. It was somewhat smooth and sort of crisp, but it wasn’t extremely dry. The carbonation was of the medium to low variety and not a whole lot of flavor was left behind after each swallow. Well, this beer was just sort of “meh” to me. I was hoping for a better showing from this brewery, but they have only been in operation since 2011, so maybe they are still ironing things out. I’d like to try something else from them to get a better grasp on what they can do. I’ll keep my eyes peeled for some of their other offerings. So, if you guys happen to see the Lore Derby Brown Ale somewhere, pick it up, give it a taste test and see what you think. Be sure to tell me about your experience if you have a few moments. Thanks for reading and commenting everyone. I really appreciate the support.